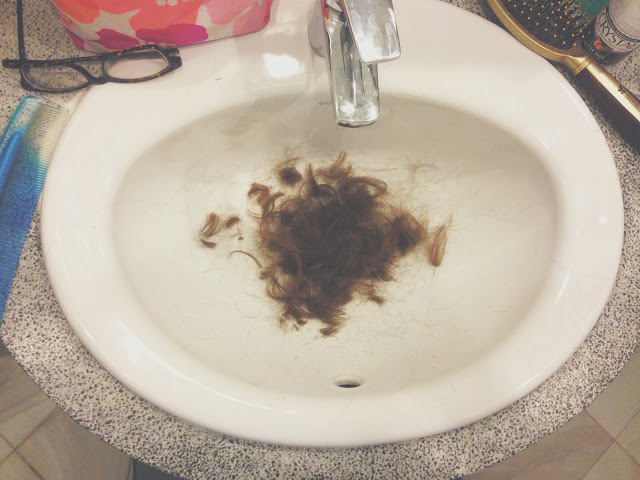 Last night I stood in front of a bathroom sink halfway full of chunks of my hair. Since moving to Cambodia, I’ve been learning to cut my hair all by myself. There are plenty of salons in this town, but I can’t bear trying to communicate what I want done to my hair in Khmer. I cut my husband David’s hair regularly, and he has cut mine a couple times. He is willing to do it for me, but giving my hair the cut it needs in this season seems to be a job only I can do. Living in Cambodia is rough on the hair. I’ve almost always had long and strong hair without much effort, but times are changing. The water here is almost clean. I can shower in the water, but the chemicals poured into the water to sanitize it, and the stuff hanging out in Phnom Penh’s ancient pipes, mean that the water dries my hair out like nothing I’ve seen before. The tropical sun also does its part to lighten and dry out my hair. I’ve tried all sorts of natural remedies for my hair (let’s not talk about the time with the mayonnaise, ok? ), but I’ve realized, for now, the only thing that really works is chopping it off. Here's my new protocol: I stand at the mirror and run my hands through my hair. When I find dry or rough patches, I cut. If the ends feel like straw, they have to go. If the hair is tangling unreasonably, it gets the scissor treatment. I try to trim the final result till it’s all approximately the same length, but, I will admit, this method is not always pretty. My hair is not as stylish as it could be, but at least it feels healthy. I can get a brush through it, and all the dead weight is gone. I realized lately that I have begun to use roughly the same method to tame my routine in this season of transition and new beginnings, as I have been using to cut my hair. With all the subtle and overt stressors on my life in this season, I have been striving to go slow. Burn out creeps up on me easily, and I am committed to be in my current ministry for the long haul. I realized the only way for me to get (and keep) my feet underneath me is to hack away at the dead weight in my schedule, trim away at the rough patches I’ve been carrying around, part ways with the tangles, sacrifice some of the length—and reap health in return. I’ve had to sit down with my journals and work through some past hurts that still weigh on my mind and take up space. I’ve had to say no to some things that sounded fun or sounded like things I would be good at (which is especially hard in a season where I feel like I’m not actually good at very much yet). I’ve ditched some expectations, and I’ve deleted items from my to-do list when I realized I don’t currently have the capacity for them. (Yes, after ten months in this apartment our walls are still bare. After looking for frames for a few months, I just deleted the idea from my lists. Maybe in another season!) I'm trying to set specific and realistic goals instead of ambitious ones. In a season where I can’t seem to string together 7 healthy days in a row, I’m prioritizing sleep and time to cook healthy meals. Perhaps most difficultly, as an introvert living in an overwhelming setting, I’ve had to sacrifice wide and deep involvement in my community for only limited, life-giving connections. I’m still working at these things. My goal for the year is to go at a healthy pace, and it turns out that healthy at this stage of my ministry is slow. Really slow. I’m working on taking Sabbath seriously. I’m working on not letting expectations, from others or myself, push me too far or distract me from my core ministry. This process isn’t very glamorous, but as I settle into a pace of life and ministry that seems sustainable, my body, my spirit, and yes, even my hair, feel more healthy.